As it happens, sometimes, on Windows 10 and also on previous versions of the OS such as Windows 8/8.1/7 when you try to open a file, folder or any software a ‘security warning’ window greets you by displaying “This publisher has been blocked from running software on your machine. You must unblock this publisher to run this software” error message. 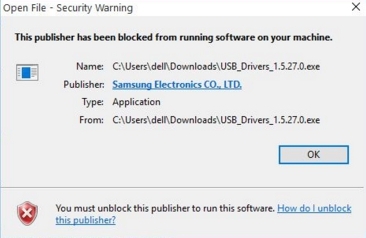 If you ever encountered this warning message when trying to run a program or software on PC Windows 10 or Windows 8 & 7 then you have come to the right place to learn how to fix “This publisher has been blocked from running software on your machine” error for good by using fixes explained below in this post. As you can see in the image above there is a link ‘How do i unblock this publisher?’ at the bottom of the warning window, when you click the link it will take you to the web browser where you can search the solution for the error over the internet, which could take some time as there aren’t many helpful solutions available online that address this issue. Even if you manage to find the solution there is no guarantee it will work. This error message doesn’t regularly appear for most programs, only a handful of software might encounter it but that particular program could be of value to you, so it’s better to know in advance how to tackle such errors on Windows PC/laptops. Below we have provided number of solutions to solve “This publisher has been blocked from running software on your machine. You must unblock this publisher to run this software” error. There is no standard fix for the issue that’s why we have explained numerous options so that you can try them until you find the one which works best on your PC. Try these fixes below; different solutions may work on different PCs depending on Windows OS version and hardware configuration of the computer. Let’s start with the simplest of fixes, if software program isn’t opening on your Windows 10 PC because of “This publisher has been blocked from running software on your machine. You must unblock this publisher to run this software” error warning, it might be because it’s not compatible with the version of Windows installed on the computer. If you try to run software designed for Windows 7 on Windows 8 or Windows 10 then it might not work. So, download and run only that software/driver version which is compatible with your Windows copy. 1 – To open Internet Options on Windows 10, go to Start > Settings > Network & Settings and select either ‘WiFi’ or ‘Dial-Up’ option on the left-hand pane of the window. 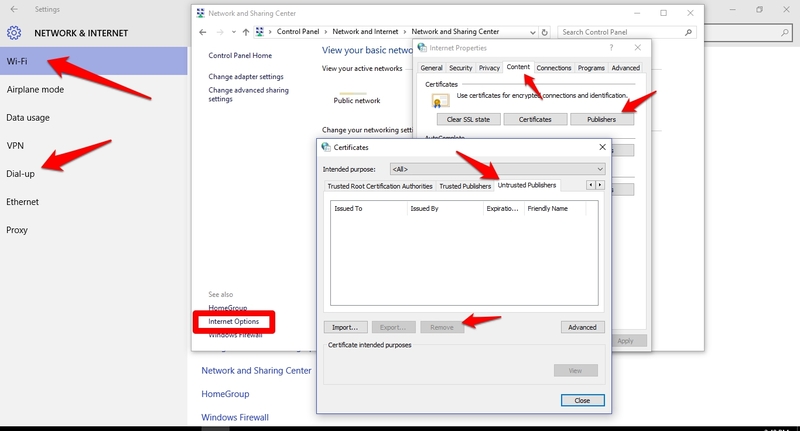 On the right pane, click network and sharing center option. 2 – On the bottom left corner of network and sharing center Control Panel window, click on ‘Internet Options’ which will open a new Internet Properties window. 3 – Click the tab named content on internet properties window and hit Publishers button. 4 – Another small window titled certificates will appear on the screen. Select Untrusted Publishers tab on it which shows the list of publishers whose programs are barred from running on your PC. 5 – Select the publisher from the list you want to unblock and click remove button. Now try running the program or file that was not opening previously. It should be working normally by now, if not, then move on to the next step below. 1 – Open Internet Options from Windows 10 settings menu or control panel as describe in the step 1 of previous (solution 2). 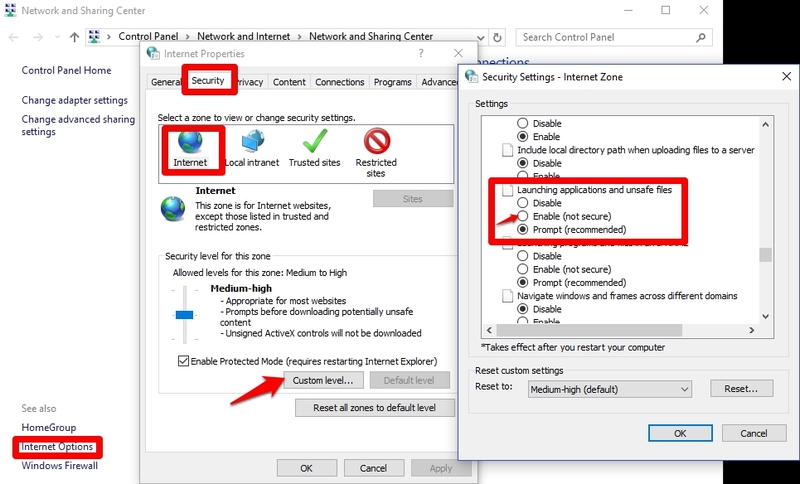 2 – Click Security tab on Internet Properties window and then select Internet under ‘Select a zone to view or change security settings’. 3 – Now click Custom Level button which will open a new security settings – internet zone window. 4 – In the settings box scroll down until you reach Launching Applications and Unsafe Files option, check the ‘Enable’ box and hit OK button. note: Ignore the security warning and proceed. You can go back to previous settings by checking prompt box instead of Enable box if this solution proves fruitless. 5 – After checking ‘Enable’ box click OK button, a new dialog box will pop-up showing ‘This app/software/program has been blocked for your protection’ message on the screen, which you can get rid of by removing User Account Control (UAC). 6 – In order to disable UAC download this third-part tool Disable UAC here and install it by following on-screen instructions. 7 – After installation open “Disable UAC’ tool and check the option which says Disable User Account Control, click OK button and restart PC. 8 – After the restart, open/run the software/file which was showing “This publisher has been blocked from running software on your machine” error before. It should open without any issues this time around. After installing the software that was being blocked by the error message, you can enable UAC again by deselecting disable user account control option on third-party ‘Disable UAC’ utility installed in step-6 above. 2 – Select Privacy option. 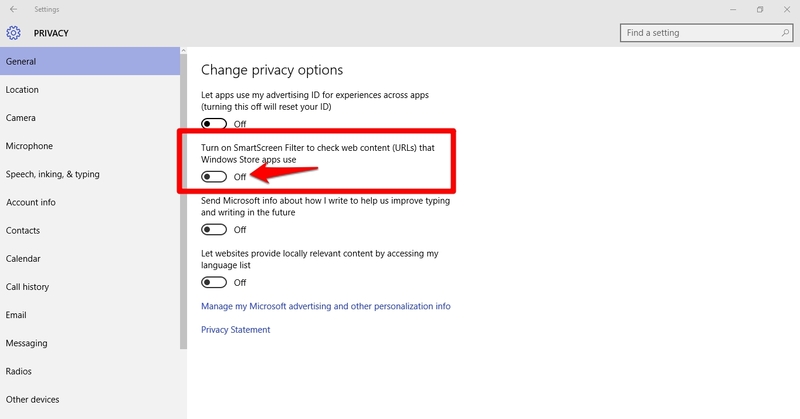 3 – On the right pane of Privacy window, switch off the option that says ‘Turn on SmartScreen Filter to check web content (URLs) that Windows Store apps use’. 4 – Close Settings Window and run the software program, click ‘run the application anyway’ when a message stating ‘SmartScreen Filter cannot be reached’ shows up on the screen. You can do two things to ensure that “This publisher has been blocked from running software on your machine. You must unblock this publisher to run this software” error message doesn’t pops-up when you try to run a program or open a file. First, disconnect the internet and then try installing the software. Second, authorize the publisher by right-clicking on the file, select properties from the context menu and hit unblock the publisher option to see if it gets the job done. Try opening software program by first disabling Windows firewall from control panel. Right-click the Start button and select Control Panel from the list. Or go to Start > Control Panel > System & Security > Windows Firewall > Turn Windows Firewall on or off to open customized settings window screen. 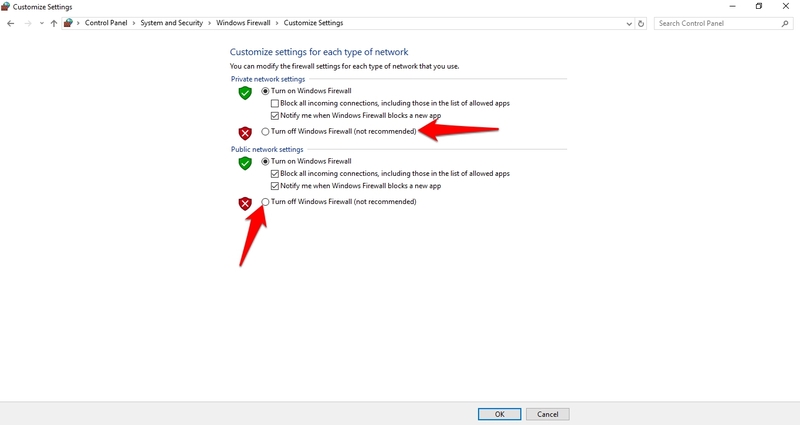 You will see two options on the screen ‘Private network settings’ and ‘Public network settings’, check the box next to turn off Windows Firewall option under both public and private networks. Close the settings app and run the software/file. It should work after the fix. If all else fails try this last solution, which is sure to work. However, we advise you to exercise extreme caution while following steps mentioned below as it involves tinkering with Windows System files and even a slight mistake in accurate imitation of the instructions could adversely impact the normal functioning of the Windows 10 OS. Run the program blocked by “This publisher has been blocked from running software on your machine. You must unblock this publisher to run this software” error using command prompt as an administrator. Go to c:/windows/system32 and scroll down the window until you find cmd.exe file on the list. Right-click on cmd file and select ‘run as an administrator’ from the context menu to open it. In command prompt window type location of the program where it’s saved on PC. Let suppose you want open a file from documents folder then type cd/Users/Your Username/documents and press the Enter key. Now type software, file or program’s name and press enter. This unblocks the program and runs it without any warning messages or errors. After following instructions in all solutions provided above you would be able to open and run any program and file without any “This publisher has been blocked from running software on your machine” error warning again.